In my former life I was a hockey player. The confession is that broke the record in my high school for penalty minutes. That’s right, I was in the penalty box my senior year for over 100 minutes. But those are just details. I’m not proud to say that I think I still hold the record. I am also not proud that the parents from another college prep school tried to sue my school because I got in a fight with her daughter on the ice. Seriously, don’t mess with hockey moms. But what was my little 17 year-old deal? This wasn’t the NHL. I wasn’t an angry kid off the ice – so why was I acting this way? Well that is a long story about how I was trying to figure out how to deal with some grief and loss in my life. During that season I had been in the room to watch my dad take his last breath. So you can imagine senior year, not being able to look out to the bleachers and see my dad at every game took a toll on my little heart. But here’s the thing, God did some major work in my heart and in my life over the next few years. By the time I made it to playing college hockey, I was playing fair and I didn’t get into one fight in college. That’s not to say that I didn’t end up in the penalty box way too often. I was a passionate kid – I still am! It takes a lot of growth and maturity to figure out how to harness that passion, and I know it will be a life-long quest for me. You see, when you love others, you care. When you care you are passionate, and passionate people have to fight through things sometimes. I had to learn that physical fighting = never appropriate. Verbal fighting = not as appropriate as 17 year-old Steph thought. But sometimes fighting IS necessary because sometimes fighting through things that matter produces important fruit in our lives and in the church. I believe with the Holy Spirit’s leadership, the church can fight well. We can fight through the most important things in life, politics, and the church while still maintaining love, grace, and humility. We can pursue unity, while not having uniformity. Jesus prayed in John 17 that we would have unity and that it would glorify God. 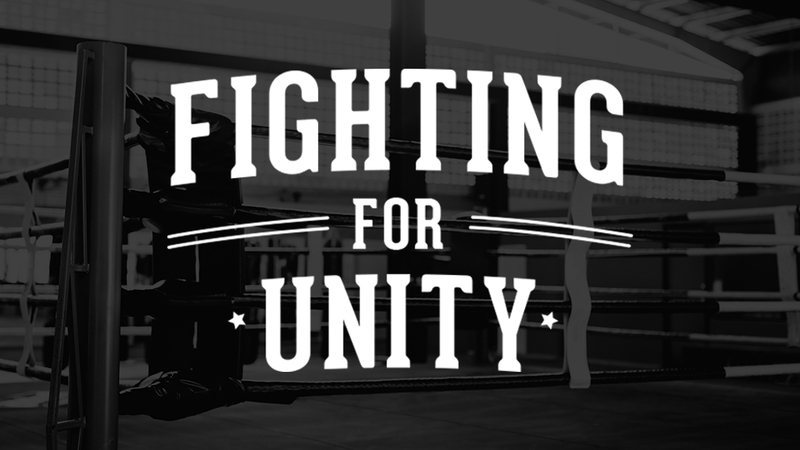 To be Kingdom people we have to fight for unity. We will have to let the Holy Spirit in every moment. But trust me, love is worth the fight. Click here to hear Pastor Steph’s recent sermon on this topic.